Login to X-tensive.com with your own account. Activate your licenses by clicking on links in e-mails we've sent to you ("Thank you for purchasing our product. To register it, follow the instructions below: ..."). Install company license by copy-pasting its content. 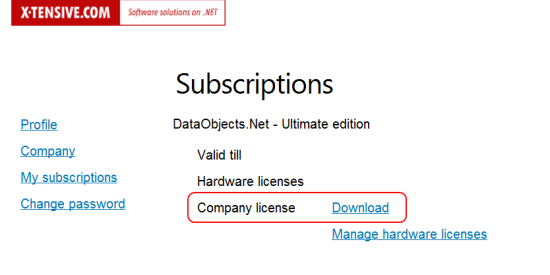 Activate Hardware License for it it via Internet - by clicking on corresponding button there. If this is impossible (e.g. there is no Internet connection), you can activate Hardware License manually. You must visit Profile\My Subscriptions page again, click on "Manage hardware licenses" and register your HWID there. Your hardware license bound to this HWID will be generated, so you should copy-paste it again. Your HWID is displayed by License Manager. how can we extend a trial period. i installed 4.3.1 on one machine it says 18 days remaining n other shows already expired,whereas in license manager expiry date shows 31/10/2010. i need somemore time to evaluate. For now there is no way to extend Trial period, but shortly this option will b available @ My Subscriptions page as well. About "expiry date shows 31/10/2010" - we'll check this. Actually, this is the date of expiration of current version (hard-coded), but it shouldn't be shown there. i do not want it to get extended but if its available till 31st oct. then also it will be really great. i uninstalled and reinstalled but still no help...i jst tested it for a month. any ways out. Likely, it will expire earliier - i.e. in two month. Most likely License Manager simply displays wrong date. ok, atleaeat i should get two months from the installation,i dint even get that two months complete. i really want to go for DO 4.3.1 but not in haste, anyways i was just checking pricing model, wht does update period means? is it that the purchased edition will expire in one year. or we will not be entitled to get any updates. No, you'll be able to use it. > or we will not be entitled to get any updates. > I should get two months from the installation,i dint even get that two months complete. These two months are counted from the first installation of DO4; anyway it will be easy to extend your trial shortly. I mean, first installation of DO4 with licensing module, i.e. any v4.3.X. We alreay purchased a 3.9.x version earlier. are we suppoosed to get any discount on new purchase. we are interested to buy either prof or standard edition. I just updated the order page - now there is information about all the discounts. In your case you can get 15% discount for Professional Edition and its HW licenses by entering "CUSTOMER" coupon code. We will - you should know I even shared a document describing the changes we must implement in licensing module to make this much more intuitive. But so far this isn't the most important part, especially - from the point of paid customers. I'm working in a company. and i install in a company license the key. I want to change this key but the button install become disable :'(. How can I change Company License ??????? Just clear the folder and after that you'll be able to install new company license.